In 2011, Hanover Engineering Associates was contracted by the Tunkhannock Creek Association to develop a Master Plan for Trout Habitat Improvement along the Upper Tunkhannock Creek in Tobyhanna Township, Monroe County, Pennsylvania. As part of the project, Hanover Engineering completed the design and permitting required to install 33 new trout habitat improvement structures throughout the Association’s stretch of stream. New structures included rock vanes, rock cross vanes, stone deflectors, log-face stone deflectors, stone deflector with single log, J-hook rock vanes, one log deflector, one channel block, and one bank cover crib, as well as random boulder placement. The combination of these improvements with the normal high stream flow volumes and velocities in the Upper Tunkhannock Creek creates pools and pocket water, as well as promotes development and restoration of riffle zones, to provide improved trout habitat conditions within the vicinity of the new structures. 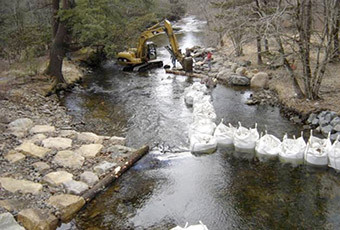 Careful planning and design allowed for streamlined permitting and minimized impacts to the stream during installation. The entire project was approved under Statewide General Permit No. 1 – Fish Habitat Improvement.